the Ring Master on "Super Circus"
Photo was taken back when Claude co-hosted with Mary Hartline on the program. 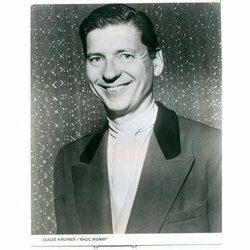 No..Bob..Jack Sterling didn't host a circus tv series..before Claude Kirchner ..Jack hosted his own kids circus tv variety series"The Big Top"for CBS TV..saturday mornings from 1951 to 1957...Claude hosted"Super Circus"on ABC TV..first from 1949 to 1955. Wasn't he preceded by Jack Sterling as a ringmaster in a similar outfit? I recall Claude Kirchner as a puppeteer, or at least appearing with a puppet named Clowny. The show might have been "Terrytoons Circus" from WOR-TV 9 in NYC. I was terribly excited about a gyroscope toy offered on the show one day, and begged my parents for it. It cost 50 cents, so my dad carefully cut out circles in a piece of cardboard to hold the quarters, and we mailed them. The gyroscope never arrived. Many years after (in about 1973) having been a fan of "Super Circus" (in 1950), I was riding on a commuter train from Greenwich CT to Manhattan, and heard a familiar voice talking from the seat right behind me. I couldn't place who it was, but turned and saw that it was Claude himself. No big deal, but I thought it was remarkable that after so many years, I could remember that voice.